Training is one area we really enjoy here at Caeco Ranch. Our Program is based on three main factors. For both the horse and rider. Each step of training must proceed only when the horse has become relaxed with the trainer and what is being asked of it. This is equally important for ground work as well as when the horse is ridden. Between the horse and rider. The horse is allowed to learn at his pace. A bond must form between the horse and trainer so that trust is developed and both are confident in the others ability and willingness to perform each task. It is important for the horse to have respect for the rider, and at the same time it is just as important for the rider to respect the horse; both for its size, and the knowledge it has acquired through the training process. 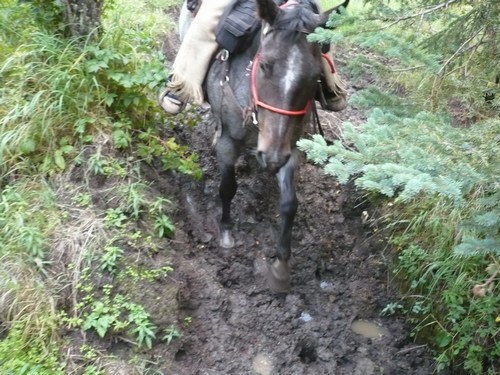 Our training system takes the horse from basic ground work, round penning and cues, to mountain rides where the horse is asked to cross creeks, bridges, marsh areas, and go through dense bush. When finished the horse will be ready for the average rider to take for a pleasure ride, in an arena, ditch, or the mountains. The horse will have received exposure to various distractions such as tarps, wind, dogs, bikes, hikers etc. as well as trailer loading and unloading.